And so, I present you with these mushrooms that we saw. Just sitting out in the middle of nowhere. Together. With no others around. And friends? They're pretty big. The picture does not do them justice. Can't you just imagine some little fairies dancing around under them? A whole miniature woodland community coming alive among these colourful fungi? Taking refuge under them from the rain and weather? Casting their magic spells before they flutter away in the wind in search of their next adventure? Oh My! 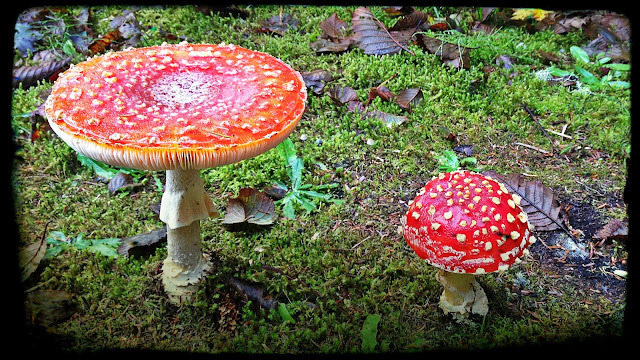 I have always seen drawings of these in fairy stories but I never had any idea that they actually existed. Wow! It must be enchanted up where you live. Thanks for sharing! I love those. We have those here in Dryden. And yes, I totally imagine fairies every time I see them.